Or should that be fairy cakes? Either way, I’ve been taking the Wilton course 1 cake decorating class which has been a lot of fun. I’ve been struggling with getting the consistency of my icing just right, which has made things difficult, but I think I’m getting the hang of it. We’re doing a lot of other fundraising events at work- snack and bake sales, bingo, a car wash, a yard sale, lunches, a golf mini-event, some raffles… if you have any tips or suggestions, I’d love to hear them! Why the American Heart Association? The company has always been charity-minded, but we choose to focus our attention on a few select charities in order to help them more deeply. Our president suffered a major heart attack a few years ago, and he and his family were touched by the people and the work of the AHA, so we have decided to support them in their ongoing efforts. Cardiovascular disease is America’s number one killer, and I imagine most everyone knows someone who has directly or indirectly been affected by its consequences. My First Etsy Treasury Spot! Etsy member Dolphinmooncreations has featured my Caribbean Sea Earrings in her The Blues Have It! 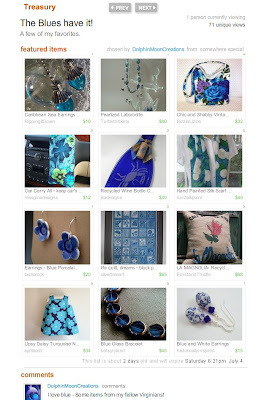 Etsy Treasury featuring blue items from Virginia sellers! (you can click on the image below for a larger view) Be sure to check out the Treasury, as well as the curator’s shop- she has a ton of options for personalized pendants and other items that look so awesome. My mom’s on this new hummingbird kick, so I’m very tempted to buy her a “My Hummer” necklace!